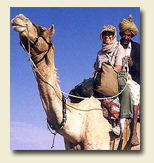 Royal Wheels India is an adventure travel group organising Camel Safari Tour Packages in Rajasthan. One of the unique way to explore small villages in Rajasthan is by camels. 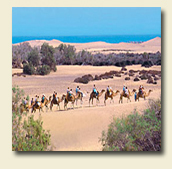 Camel Safaris atop this ship of the desert is most exciting and thrilling adventure. Riding a camel is not easy as people consider. It is neither a great test for endurance. It is a great experience to explore The Thar - a vibrantly, living, desert, very colourful and hospitable. Itineraries of 2 to 7 days can be arranged traversing approx. 40-50 kms a day on camel. These itineraries are planned in the region of Bikaner, Khimsar, Osian and Jaisalmer. Night halts are usually given near the village to provide opportunities to mingle with the local village folks and to provide insight to the traditional way of their life and culture. Besides one camel per person on the safari, a camel cart accompanies on the tour to handle baggage and allow riders to take rest as and when required.